"dehumidify." YourDictionary, n.d. Web. 13 April 2019. 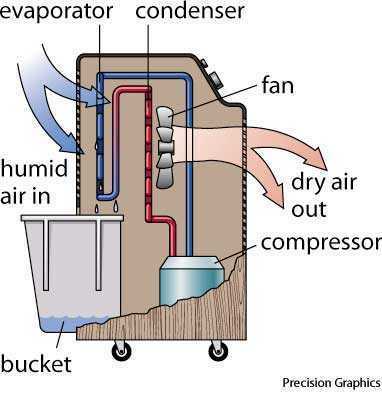 <https://www.yourdictionary.com/dehumidify>. To remove atmospheric moisture from. To reduce the moisture in a body of air; to lower the humidity. Many air conditioners, in addition to reducing the temperature, also dehumidify the air. This unit does not include a heater, but it does dehumidify as it cools.